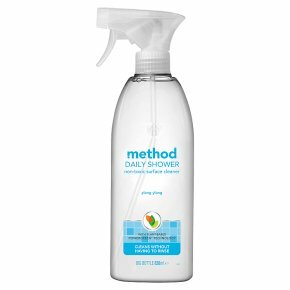 This effective shower spray is free from parabens, phthalates, amonia, animal by-products and triclosan and comes in a 100% recycled and recyclable bottle. Used daily this shower spray will prevent soap scum from building up, while dissolving mildew, hard water and lime stains. The spray comes with a lovely ylang ylang fragrance in an 828ml pump-action spray bottle. With non-toxic plant-based powergreen technology. Cleans without having to rinse. Hello, we're method. We are people against dirty®. In your hand, you hold the power to join us in the good fight, the fight to make our planet, and homes, a cleaner place. We are passionate believers in the Cradle to Cradle® design philosophy, meaning that each one of our products has a past and a future. That's why we make our bottles from old bottles and our non-toxic cleaners are biodegradable, it's also why every material we use is assessed by independent scientists for environmental quality + safety for people. Because we believe that cleaning products can put the hurt on dirt without doing harm to people, creatures or the planet, they can even smell like rainbows, it might sound like a tall order, but we're a small, passionate bunch with big ambitions. We suspect there's a direct correlation between clean tiles + big smiles. A spray a day keeps the scrubbing away. Effortlessly maintain the gleam on your clean tiles with our daily shower spray. With powergreen® technology, it dissolves and prevents soap scum without you having to worry about chemical residues. Very little exertion required. We would say "no exertion required," but you do have to engage your trigger finger. Easy to use: Shower. Spray on damp surfaces. Leave to work its magic. For use on most sealed surfaces. Showers, tile, fixtures, glass, tubs Psst: It's always a good idea to test in an inconspicuous place first.